Shan'naal shooting at demon-possessed drow. Locating the Sarghress heir at a market picking up supplies for their trip, they attempted to follow her discretely, only to be found out by Melodia. Shan joked about the two being "busted by a cat," claiming that visions must not account for animal actions. As Chiri attempted a formal introduction, Shan took advantage of a momentary distraction to shorten the greeting, explaining that they wished to go with her to the land above . In exchange for allowing them to tag along, Ariel insisted that Shan and Chiri promise to explain their motives and to tell her everything. To Shan's surprise, Kyo insisted on coming along on the upworld journey, saying that wherever "Shanoo" went, she would go too. The newcomers showed themselves to be Kiel'ndia Vel'Vloz'ress and Naal'suul Val'Beldrobbaen, who had come to "rescue" Kyo. Kiel began taunting Chirinide, causing a fight to break out amongst the young drow. Kyo jumped onto Chirinide's back, lulling her to sleep with spellsong in an attempt to stop the fighting. 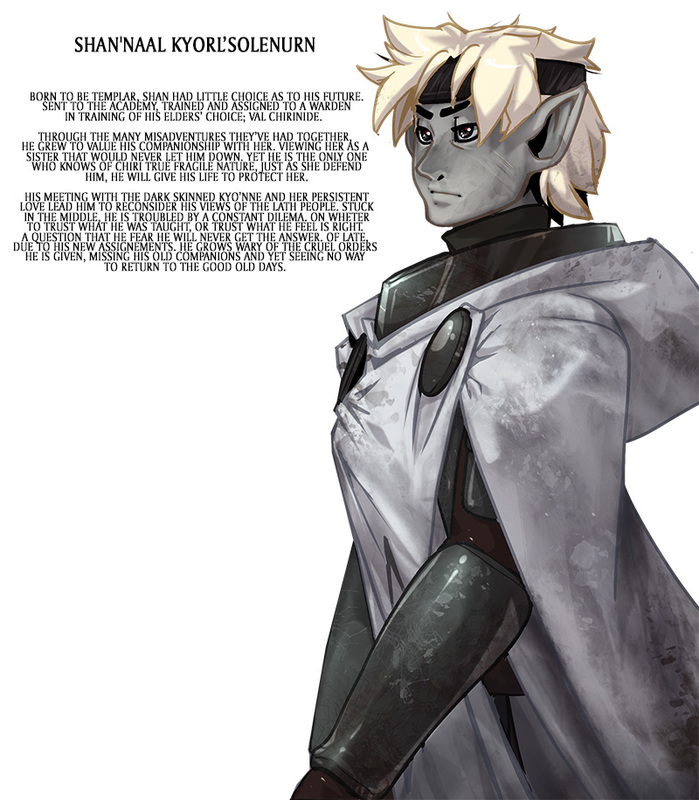 Shan carried his warden away from the others, telling Kyo that he would kill anyone who dared insult Chiri again. . An agreement was made amongst the young drow that they would continue together toward Machike, without any further conflict. During the rest of the trip, Shan continued to support Chirinide, listening to her many complaints that they will not be able to properly protect Ariel while the tainted are traveling with them. Upon reaching the Order of Serenity Outpost, which appeared to be a quiet, peaceful but small temple. Shan took in the surroundings appreciatively, commenting that he wished he could have such a laid back job when he grew older. Chirinide scolded him however, stating that she would need him by her side when he was older. They greeted one of the servants, Se'tewa, and were welcomed to the temple. Freyr insisted that they follow him back to Vanaheimr, as the forest guardians were awakening. As they entered the city of Kvekya, Shan made note of a gigantic tree they passed, along with questioning why they were being led through the city via back routes and hidden walkways . Freyr explained that it was best to keep the populace from finding out about their presence until the Vala, or queen, could decide what to do. As they approach the tree, Freyr advises them of their arrival at the Spring Palace, explaining some of Kvekya's history as well. After receiving a hug from Freyja, the group was led to a bathing area, where they were allowed to bathe and rest. Despite the gender segregation, Shan'naal expresses that he cannot be separated from his warden. Later, during the night, the three drowussu awoke to find themselves being attacked by veiled assassins. After escaping out through the window, they traversed a narrow ledge, stopping at a window and discovering that the other Vanir refugees were being slain by the same assassins. Shan consoled the distraught Chiri, who regretted having brought the group to their unwitting deaths . Shortly afterwards, Chiri nearly fell from the ledge, having been struck by another vision - this time of more assassins waiting at the end of the ledge. Chiri was then pulled from them by a guardian tree, to Shan's horror; he noted the presence of a fire brazier and called out to her. Using the embers, the warden was able to use the fire to free herself and fight off the destructive trees. Shan'naal is unable to be at Chirinide's side, during the Judicators' annoncement. At a table nearby, the pair watch another group of templar and wardens having a heated debate over the Sarghress situation. Chiri attempts to ask for news from them, but was rebuffed by one of the wardens. Shan stood up to defend her, but was stopped by Chiri. They sit back down and are about to continue their meal, when they are again interrupted by a procession of wardens, judicators and inquisitors. Shan commented that things were steadily going from bad to worse. They agreed to finish their dessert in their rooms, while Chiri changed into something more appropriate. The next morning, Shan was practicing his archery when he noticed Chiri making her way to the stable below the archery range visibly upset. He followed her, asking what was wrong and commenting that she would freeze if she went outside dressed as she was. When she refused his offer to go back inside, he knelt down, wrapping her feet with some cloth. Chiri praised him, commenting that he was always so thoughtful, to which he replied that it was a blade's duty to take care of his warden. Chiri thanked him, and asked him if he was only her blade. Shan blushed, and told her that she was more important than that, receiving another hug from Chiri. Countering Yuh'le's deadly high sorcery. As Shan was about to succumb to the empathic assault, intervention arrived in the form of a now one-armed Ariel, who managed to subdue the empath. He crawled over to Chiri, who still had not regained consciousness and was being treated by Faen. Realizing that she would have died without Faen's own empathy stabilizing her, he profusely thanked Faen, telling her that she had saved Chiri. They began a quick headcount, realizing sadly that they would be unable to save Riz'ria. Ariel chose to look for the rest of their party, while Shan and Faen evacuated Chiri and went to look for the others. Shan'naal and Chiri'nide were found practicing in the Sarghress weapons yard when Ariel arrived, carrying a missive from the Order of Serenity outpost. Chiri opened the missive, and was alarmed to find that the message reported the arrival of the new Holy Mother at the Eastern Gate, but was five days behind. Shan commented that the arrival of another Holy Mother with Valla'drielle still in charge would only stir up trouble. Ariel offered to join them and began to shapeshift into a drowussu, hoping to escape babysitting duties by going on another mission, but was declined, as Shan pointed out that she was way too tall. Chiri jealously stated that he had been staring at her, which Shan replied was due to her hair being like Chiri's when shapeshifted, but "crazy." Chirinide and Shan'naal--now mates--traveled to the surface once more to live in the Shikomei colony on the tail end of the winter season. While gathering wood he and Tir'ade seemed unhappy with what little deadwood they could find. Unless given permission by Felyn, they could not cut down a living tree. Shan was interrupted by Shinhwa's calls of emergency; Chirnide had fallen ill while trying to cook a proper meal for him--Dan'suun later reveals that Chirinide is pregnant, and that their child will be born different if carried to term on the surface. This worries Shan greatly despite Tir'ade's encouragement. In fact, Abyte herself was worried about the condition of any children she may have due to their taint, but Shan gains an idea from Tir'ade's words towards his mate: to propose a union to Chirinide.